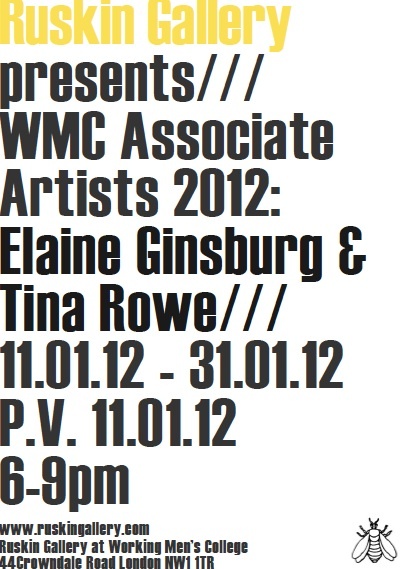 Ruskin Gallery at Working Men’s College is pleased to announce the upcoming duo exhibition by Associate Artists Elaine Ginsburg and Tina Rowe. Associate students at the WMC aim to develop independent creative projects over one year. The small tailor made programme enables students to build their portfolios in their specialist fields before entering the creative industry or applying for postgraduate studies. Using a wide range of media, Ginsburg is driven by thorough investigation of materials and techniques. This show presents her recent experiments with solutions of acrylic paint applied to paper and raw canvas with foam sponges, which she makes herself. She plays with layering, glazing and wiping off ambiguous semi-organic forms and subtle injections of contrasting colour. This reflects her interest in process and what philosopher Christine Battersby (in her book The Phenomenal Woman, 1998) has called “a feminist metaphysics of fluidity”, which focuses on “becoming rather than being, where new forms are perceived from forgotten patterns of difference”. Process and material are also a key focus in Rowe’s production. By introducing the print to layers of liquid chemicals and pigments, Rowe observes the reaction and manually manipulates the colours and shades of the photographic images. This processing of images on various types of paper allows a greater degree of creative freedom that is different from that of digital construction. 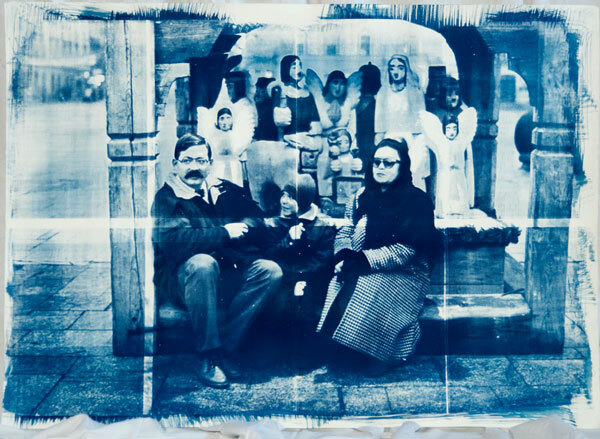 The resulting vibrant cyanotypes act as a reminder of the physical labour and chemical reactions inherent in the field of photography. Contrary to Ginsburg’s abstract pursuit, Rowe’s photographic subjects include families and strangers in Krakow or Hamburg that are brushed with multiple colours and dipped in sunlight. The exhibition will be accompanied by an essay written by the curator. Elaine Ginsburg lives and works in London. 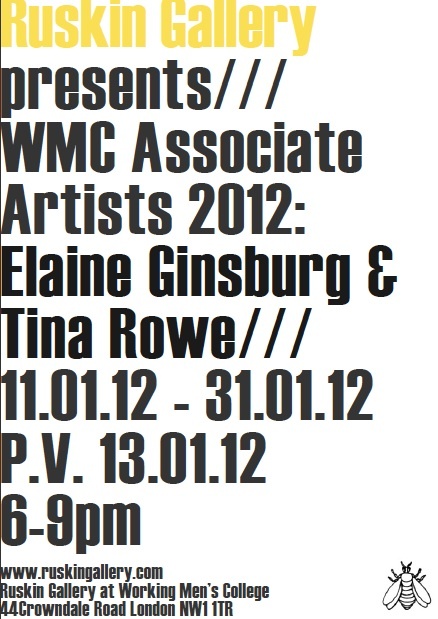 Her recent shows include i-sho at The Gallery, Stoke Newington (2011) and Pragmata at Islington Arts Factory (2011). Tina Rowe lives and works in London. Her recent shows include London Independent Photographers’ Annual (23rd) Exhibition, Strand Gallery (2011) as well as Fitzrovia Photography Prize, Diemar Noble (2011). The number two is a strong number. When presented with two matters, two things, two artists, their characteristics become more decisive, similarities strengthened, and differences more apparent. The number two is able to propel the process of compare and contrast, of creating analytical tension, repulsing ambiguity and loving coherency. Superficial differences are clear between artists Elaine Ginsburg and Tina Rowe – in fact they are at times oppositional. Whilst Ginsburg‘s works are accounted as abstract configuration using paint, Rowe presents figurative images derived from photographs. The ephemeral allure in Ginsburg’s approach is pronounced in each piece, where round foam strokes dominate the lucid background, and where each layer of paint remain visible, exposing its own purpose. Ginsburg’s minimal compositions are poetically prescribed, displaying the contrast between warm and cool colours but Rowe depicts images of animals, children, old men and stations. Her vivacious but nostalgic cyanotypes refract organic compositions, where chemical reactions between light, gum arabic, water, solvent and darkness create images that are bold in colour, yet also faint in existence. More significantly, their process is equally distinguished from one another. Ginsubrg’s procedure can be described as wholesome, but Rowe’s photographic process is much more fragmented both technically and aesthetically. Ginsburg begins with an empty canvas and envisions her composition in a unified way yet Rowe’s method considers each stage, each progression in a semi-encapsulated manner one after the other, with pauses in between. Whilst Ginsubrg’s compositions work collectively, simultaneously and in unison, Rowe completes her work in segments that can afford a fragmented and ethereal quality in her images. As differences become clearer, where black gains a few shades and white increases its luminosity, commonalities also appear, strongly yoking the two subjects/objects. Each silver thread of commonality then gives birth to thoughts and relationships that were previously inconceivable, opening up multiple cells of reality that summon other thoughts. One of the more considerable aspects to be mentioned here is the artists’ manner towards the act of creation. One’s manner towards art depicts the relationship they have with art, and not merely their attitudes or artistic processes. Ginsburg and Rowe present cautiousness, willingness, seriousness, and nervousness in their practices, which were particularly visible during the studio visits we have had. Ginsburg’s sketchbook acts as a detailed documentation of every artwork she created, that are complete with thumbnail images, precise notes, ideas, and aesthetic formulas. Equally, Rowe manages a blog by recording every experiment, image, thought and procedure she undertook. Ginsburg and Rowe both present cautiousness in their practice, slicing and dissecting each method and process, predicting or analysing the outcome through tests. The two portray a real desire to pursue and to be serious, but they also emit nervous energy that helps discover their definition of art. This nervous energy is not of anxiousness or rapaciousness, but rather eagerness associated with the greater understanding of the act of ‘learning’. Perhaps it is because the two artists were introduced to art later in life that they present such manner, or perhaps this is a reading that is deeper than necessary. Yet, I believe Ginsburg and Rowe strongly epitomise the characteristic of Working Men’s College, where many adults bring in a wealth of past experiences and an equal amount of eagerness into their subjects. Over the past few months I have noticed that the artworks of adult learners are often unhindered by institutionalised knowledge, amounting to works that feel different, that feel outside of what is commonly understood. The experience, professionalism, and various branches of knowledge these students bring forth influence their concepts as well as their outcomes, which re-invent the language of art. I not only believe that artists like Ginsburg and Rowe remind us of the importance of nervous energy, but that they also help shed new light to the vast territory of art.